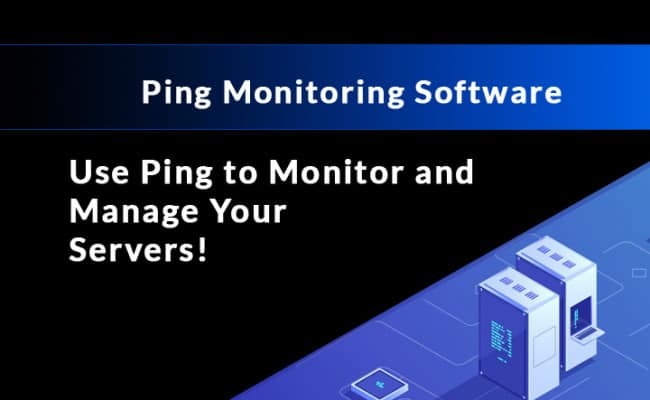 Best Ping Monitoring Software & Tools for Servers & Infrastructure of 2019! The Ping command has been around for almost 40 years, yet still remains one of the most reliable forms of network monitoring to date. Like a sonar echo, it sends out a small request packet to a target destination and expects to receive a response. At that point, it can determine if the remote device is online and if so, how long it took to respond. When it comes to IT, we value the widespread use of RFC compliant standards because it makes our lives easier. Ping is the perfect example, built in to every single operating system and accessible via the command line prompt. We don’t have to worry about installing software agents on each machine, or enabling a feature in BIOS, it just works. Which brings us to Ping Monitoring, a network admin’s best friend. With potentially hundreds (or even thousands) of devices connected to our infrastructure at any given time, we want to know that our critical systems are online and responsive. Using ICMP based ping monitoring software, we can build a complete overview of our network, generating real-time snapshots of both status and performance on a single interface. The Ping command alone can tell us if a device is online and operational, how long it takes to respond (latency) and if there is packet loss in the connection. In a nutshell, this one simple command can provide extensive information for in-depth analysis. Through the use of Ping Monitoring tools, this process can be entirely automated, aggregating the data to create a real-time and historical representation of results over time, and log to text files or displayed as charts and graphs. The Engineer’s Toolset from SolarWinds is an all inclusive, award winning package, comprised of more than 60 essential networking tools. Among the lot is a sophisticated Ping Monitoring implementation, fully integrated with the more comprehensive Network Monitoring components. 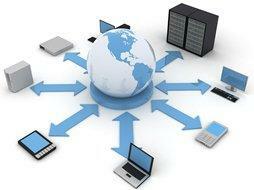 Features like auto-discovery handle the legwork, automatically importing all devices from a specific subnet. Once these are tracked by the software, you can just enable/disable the continuous ping monitoring on each individual node. 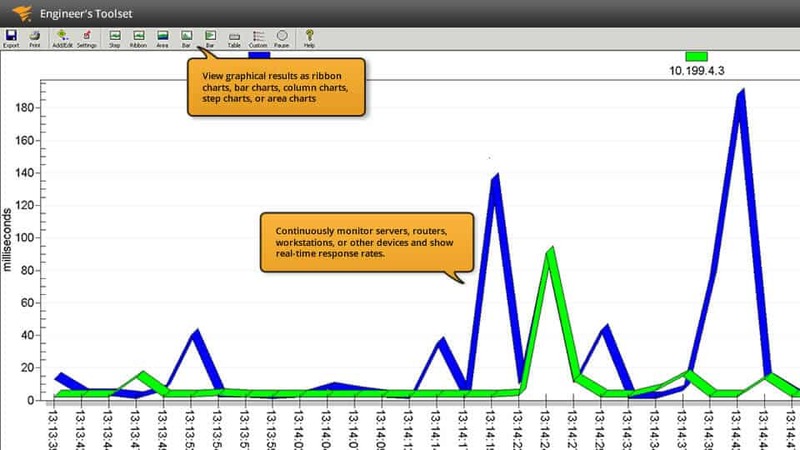 Log Statistics are readily available for any monitored device, which can be exported via text files, with relevant graphs attached in image format. These results can then be displayed in a variety of styles, including ribbon, bar, column, step or area charts. In contrast to software built exclusively around the ICMP ping command, SolarWinds Ping Monitor is just one part of a more complete package, able to paint a detailed picture of how the device is performing in all regards. In addition to checking if it’s online, response times, packet loss and other basic operations, you can also view complete resource utilization (CPU, RAM, Disk), network traffic and much more. The complete Ping Monitoring solution is more than just a Ping command though. It’s comprised of 5 separate tools that compliment each other well and provide an incredibly robust diagnostics package. In addition to Ping, there is also Enhanced Ping, Ping Sweep, TraceRoute and DNS Analyzer, designed to locate and troubleshoot complex network related issues. 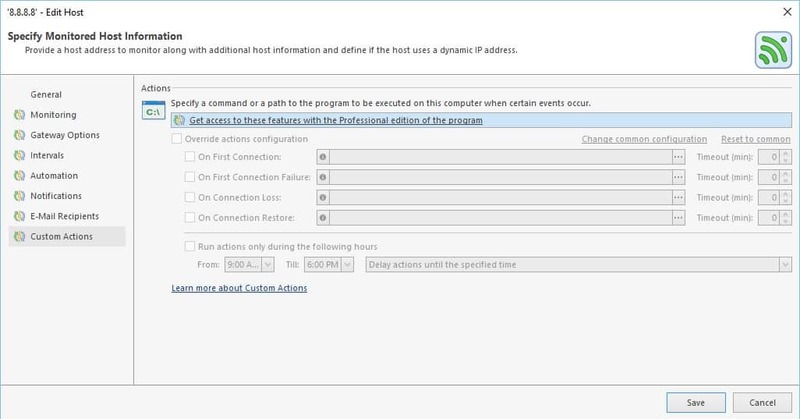 Ping Monitor is included in the SolarWinds Engineer’s Toolset. A fully functional, risk free trial is available for 14 days. Paessler’s PRTG Network Monitor is another full scale monitoring platform, similar to that of the SolarWinds Engineer’s Toolset. While ICMP ping requests are just a small part of the overall package, it’s often considered to be one of the most integral components for monitoring any type of device. As an optional sensor, ping monitoring in PRTG does not necessarily come predefined on each device. Their modular structure allows the user to cherry pick from dozens of available sensors instead, assigning them as needed. In most cases however, this will be considered a fundamental piece of every device template, rarely excluded from the configured sets. The core Ping sensor provides all of the basic information in both real-time and historical views. This includes minimum, maximum and current ping times, packet loss percentages, response status and so fourth. To expand upon the rudimentary features, more advanced functionality is offered in the form of Ping Jitter Sensor and Cloud Ping Sensor. Ping Jitter measures the ping variance over a period of time, where lower values are more consistent and provide a better user experience overall. Cloud Ping on the other hand checks latency from a variety of global locations, such as US East and West, EU East and West, Asia Pacific and so on. Offering insight in to more than just Path A to Path B communications, but also potential routing problems around the world. The PRTG Network Monitor is free to use for up to 100 concurrent sensors. For more comprehensive needs, licensing starts at $1600 for 500 sensors and ranges up to $14,500 for the unlimited sensors package. ManageEngine provides an entire library of free networking tools, developed for small business and personal use. These often have scaling limitations, but are ideal for budget conscious startups and minimal infrastructure needs. Among this vast array of networking applications, we find the Free Ping and Traceroute Tool, capable of monitoring devices, servers and websites. It’s a no-frills solution with a simple WYSIWYG (what you see is what you get) interface, offering all of the necessary options and nothing more. It can perform DNS lookups, trace routes, generate graphs and even snapshot real-time performance statistics. 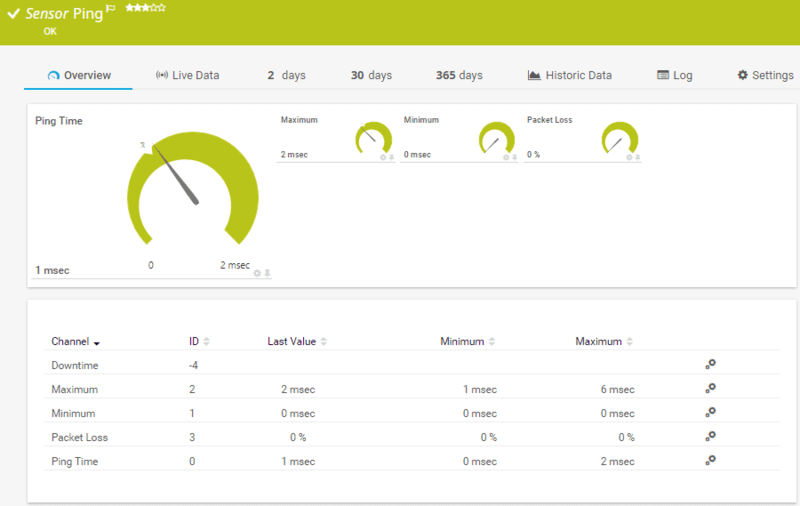 Most importantly, it has full support for ICMP based monitoring with additional statistics for diagnostics. Displayed in a tabular format on the home screen, each monitored system is identified by hostname, with the IP address, ping and status shown next to it. It also offers information such as the RTT (round trip time), buffer size, and number of successful pings as well as failures. For unresponsive nodes and other problematic events, color coded alerts are used to highlight the issue. It is fully functional and free to use for up to a total of 10 servers. The EMCO Ping Monitor is a robust tool for auditing network connections. As a standalone, ICMP centered package, it is one of the most powerful solutions on the market. In terms of monitoring, the interface is efficient and streamlined, organized to give real-time updates on the most important elements. We can determine the duration that each system has been tracked, along with an aggregated look at the statistical percentages, averages and current results. For larger infrastructure, hosts can be grouped in to sub categories, providing a more hierarchical structure to breakdown systems by type or location. 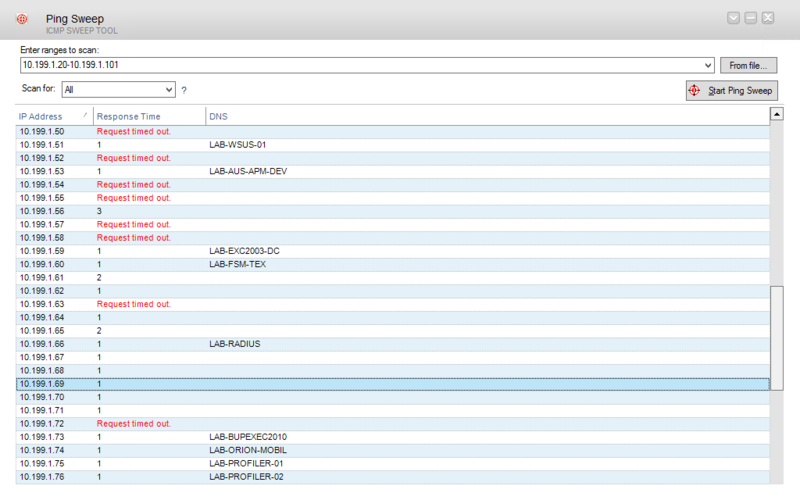 The greatest strength however is the summary details, available for every monitored host linked within the software. It provides an in-depth historical analysis of status, uptime, outages and responses, shown in a beautiful graph for a quick recap of the individual system. These can also be converted in to beautiful PDF reports, or send out alerts if the host failure rate exceeds a configured threshold. There are simply far too many features to cover here, but one of the most unique and worth a mention is the Custom Actions. As a simplified implementation of scripting engines, users can arrange for a certain command or program to be executed in the event of connection loss, resume and so on. Used in combination with the other powerful tool sets, the EMCO Ping Monitor is often ahead of the pack for the sheer functionality it provides. NirSoft’s PingInfoView is a small, lightweight ping monitoring utility without any extra bells and whistles. It’s only purpose is to ping multiple hosts, either by IP address or hostname and determine their status. Each remote system is shown in a sorted list, identified by Host Name and/or IP Address, with a green or red status circle next to the name. Additional data about the device is shown in the respective columns, including the success/failure attempts, average ping and last ping, timestamp of when it last failed to respond and so fourth. 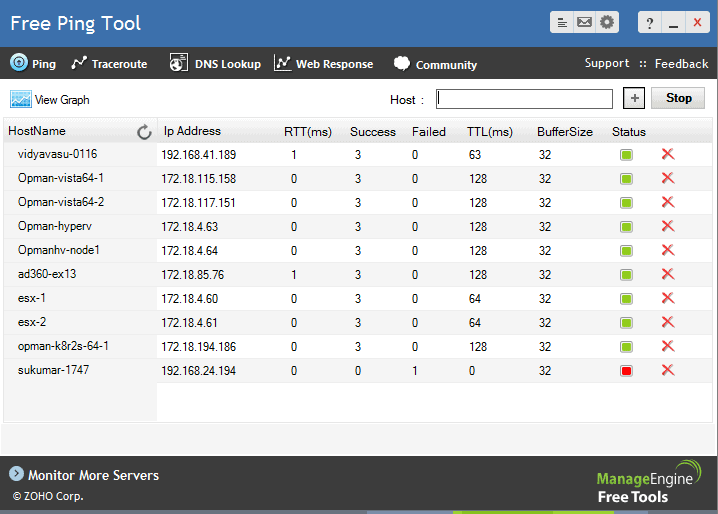 Selecting a specific host will bring up a log window at the bottom, showing a breakdown of the most recent ping results. Used in combination with the more generalized data, this not only effective for monitoring, but also troubleshooting systems with intermittent connection problems. ICMP Ping Monitor from Dotcom-Monitor is unique in the fact it is entirely web based. As such, this is more of an SaaS (Software as a Service) solution to Ping Monitoring, where all events are handled entirely through their control panel, alleviating the need to install software on a local machine. 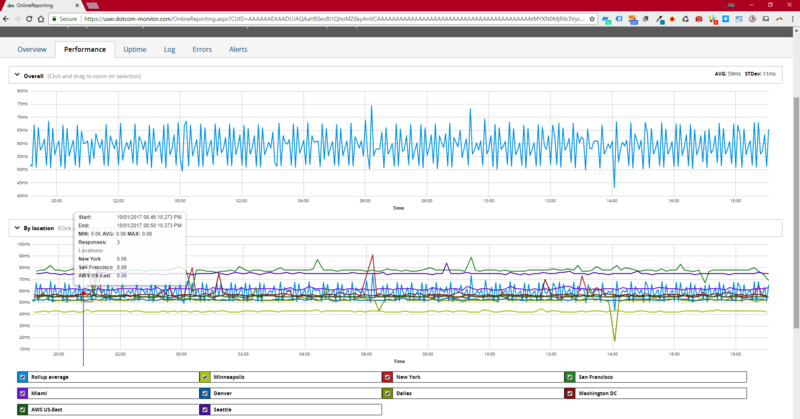 The interface is heavily based on graphs, placing emphasis on visualizing performance over time. 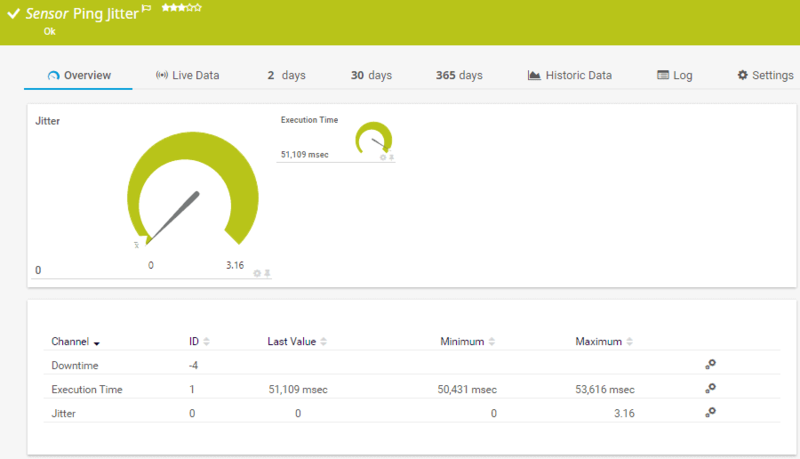 The overall breakdown of statistical data is fairly sparse however, marking responsive hosts as OK, with a basic date, time and ping shown next to it. More than sufficient in many cases, but a rather basic approach when compared to the other options available. The most appealing aspect of Dotcom-Monitor’s web based approach is evident in the alerts system. Should a particular device exceed the pre-configured limits, you will be notified that it is slow to respond or completely unresponsive. You can be notified up to the minute when a problem occurs, taking proactive action to address the situation. Knowing that critical systems and services are working is a fundamental aspect of the network administrator’s job, and Ping Monitoring is the most powerful tool for doing so. The sheer simplicity of the command is rather profound, especially considering the amount of information can be garnered from it. Depending on the specific needs of you or your organization, a simple no-frills option like NirSoft’s PingInfoView or ManageEngine’s Free Ping Tool may be a perfect fit. For complex infrastructure and commercial requirements, SolarWinds Engineer’s Toolset or Paessler’s PRTG are robust, feature rich packages that can fulfill every possible demand. It’s always recommended to try out at least several solutions before moving forward, where those that aren’t free will still usually provide trial periods to demo the software. Brett Knight Brett has Extensive Experience in PHP Scripting and high-level experience of Windows Server, Unix/Linux system administration and other software systems. He's currently working on Several Hobby projects that involve 3D printers and enjoys writing about Technology in general, as well as System Admin and Linux Scripting.